More than a year into her widowhood, Lady Isabel Morrow is still discovering things about her late husband. One of the most disturbing is the stash of original art stored in a secret room while the aristocrats and wealthy merchants to whom Andrew Morrow sold the purported originals are displaying excellent forgeries. The problem becomes pressing when London buzzes about the Duke of Ardmore’s trade of the Botticelli he purchased from Morrow to the notorious crime lord Angelus for gambling debts. Lady Isabel fears the truth of her husband’s illegal practice will be revealed just as her ward, Lucy Wallace, makes her debut. The resulting scandal will make it impossible for Lucy to marry well. Isabel decides that the solution to her problem is to exchange the paintings and for this risky deed she needs help. She contacts Callum Jenks, the Bow Street runner who investigated her husband’s suspicious death and with whom she shared one passionate night several months later. Callum, the son of a grocer, has not forgotten the beautiful Lady Isabel even though they move in different worlds. He knows that it is not uncommon for officers of the police to accept private cases, but he initially rejects Isabel’s request for help. He believes law is a tool of justice, and, however noble the motive, he sees stealing the forged painting as a violation of his duty. But when the man responsible for his brother’s murder is freed from prison due to money and influence, Callum acknowledges that the law can be used to pervert justice and that justice can be served beyond the law. He agrees to help Isabel. Isabel is just coming to terms with how unhappy her marriage was and realizing that she has the freedom as a wealthy widow to become her own person rather than hiding behind the facade of a pretty, conventional ornament to society. As she and Callum work together, they become friends, sharing an emotional intimacy that has been missing in both their lives. Of course, the attraction that flamed that one memorable evening still simmers. Is what they share strong enough to bridge their class differences? 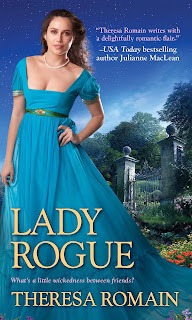 Lady Rogue introduces Romain’s Roguish Runners Duo, but it has strong connections to Passion Favors the Bold, the second book in the Royal Rewards set. Callum’s brother Henry was one of the guards killed when newly minted gold sovereigns were stolen, a crime that is central to that book. Callum was a secondary character in the novel, and his disillusionment when the mastermind behind the robbery goes free in Lady Rogue leads directly to his involvement in Isabel’s theft of the forged painting. Readers who are familiar with Passion Favors the Bold will have fewer questions while reading Lady Rogue than will those who have not read the earlier book. I have often said that I can forgive almost any flaw in a book if I love the characters. Romain is adept at creating interesting, layered characters, and she does so again in this book. Watching Isabel break free of some of the restraints that have limited her for most of her life is rewarding. Callum is a man of honor forced to reexamine some of the basic truths of his adult life, and his struggle makes him fascinating and sympathetic. I thought it had greater resonance because he is not an aristocrat. Family members add interest and show the reader more of the people Isabel and Callum are. Other secondary characters provide color and substance. I found the beagle Briley; Butler, the artist who copied the great works; and Angelus, the crime lord, particularly appealing. Unfortunately, the plot falls short of the standard set by characterization. The story line about the switching of the paintings ends well before the book does, and it is replaced with threads that are dropped. The twist that comes at the end is a radical turn that leaves the reader unprepared. The cross-class relationship is handled with a deftness that approaches Balogh at her best with this trope, but some may think that Romain fails to make the reader believe in the passionate connection that drives the risks. Overall, if expert characterization is your first requirement, you will likely find enough to love in this book to make you glad you read it. If superb pacing and coherent plot structure are more important to you, you may find the novel unequal to Romain’s best. Love her stories - thanks!! I've added this to my "wish list".